Courtesy photo Representatives of the Valley Alliance of Mentors for Opportunities and Scholarships, or VAMOS, was recently recognized in Los Angeles as the Community Partner of the Year by the Hispanic Scholarship Fund. More than just an academic grant, the Valley Alliance of Mentors for Opportunities and Scholarships, or VAMOS, provides students with moral support as well as career exposure. Founded in 1996 as a solution to address the problem of “brain drain,” according to board member Sonia Falcon, VAMOS boasts a four-year graduation rate of 96 percent and has awarded over $15 million. 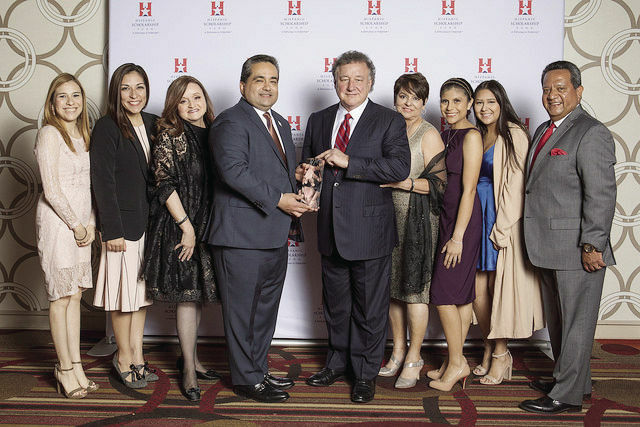 A recent accomplishment for the organization, VAMOS received national recognition in Los Angeles as Community Partner of the Year by the Hispanic Scholarship Fund. This partnership has been in place since 2001, when an endowment was established. Along with support received from the HSF endowment, VAMOS fundraises in an annual golf club tournament. By partnering with community sponsors and donors, including DHR Health and South Texas Luxury Experience, this event results in the prime source of capital. For their first two years of college, students are paired with fellow scholarship recipients from junior and senior classifications. Those in the upper levels are matched with a mentor from their field of interest. Made possible by board members, staff and sponsors — which Falcon calls “the trinity”— VAMOS serves “deserving students” of Hidalgo, Starr and Cameron counties and has awarded more than $15 million in scholarships. “It is our desire the students we award here at VAMOS give back to our community and become future leaders of the organization,” said Board President Johnny Oliva. According to Executive Director Daisy Martinez, upon completion of their schooling, many of the VAMOS graduates return to the program to mentor in a number of fields, ranging from education to law to medicine. In recent years VAMOS has awarded between 75 and 80 four-year scholarships ranging from the amount of $10,000 to $20,000. Criteria for its maintenance include the preservation of a 2.75 GPA and a 13-hour registration per semester. Falcon, one of the founding members, considers this a success not just for VAMOS, but for the entire Rio Grande Valley. This year’s scholarship recipients will be announced in a banquet in June.